Eastern Shore District High School (ESDH) opened in September, 1965, combining student populations from Robert Jamieson High School in Oyster Pond and Graham Creighton High School which enrolled students from Lake Echo, Porters Lake, and Chezzetcook. Initially ESDH had an enrolment of about six hundred students who came from all along the Eastern Shore, from Ship Harbour to Lake Echo. There were twenty-five teachers in 1965, the first principal was Helen Jennex, and the vice-principal was Dr. Rosemary Holton. In 1967 Edward Levy became principal and Mr. Ahluwalia was vice-principal. Later principals included T. McGlone in 1971, Donald Trider in 1974, and Dave Johnson in 1978. An addition was added in 1967 but by the late 1970s the school was becoming overcrowded and there was a need to divide into separate junior high and high schools. In 1978 the school was split into a Junior Department and a High School Department with one section attending classes in the morning and the other in the afternoon until the completion of Gaetz Brook Junior High in 1979. From that time on, the school has included grades ten to twelve. Eastern Shore District High School is still in operation. The majority of the records consist of essays, created as part of a school project undertaken by Mr. J. P. Milligan’s and Mr. D. R. Engram’s grade ten classes at Eastern Shore District High School between 1973 and 1980. They were later donated to the Musquodoboit Harbour Heritage Society which in turn donated them to the Eastern Shore Archives in 2012, as their mandate does not include the collection of archival materials. The yearbooks and newspaper were donated in 2006. The first three series of the fonds consist of essays and research written and compiled by Mr. Patrick Milligan and Mr. D. Engram’s grade ten students at Eastern Shore District High School between 1973 and 1980 as part of a class project on local history. The essays include information about various aspects of the history of the Eastern Shore such as industries and occupations, activities, cemeteries, churches, individuals, houses, education, and family and community history. 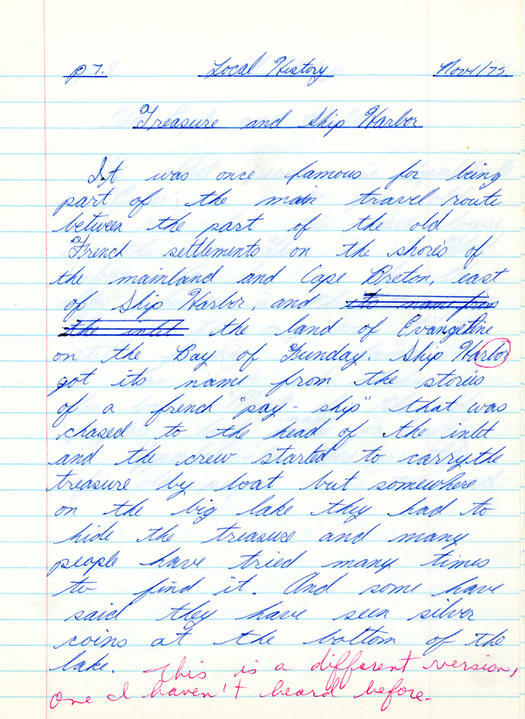 Selected essays from Mr. Milligan’s local history course, 1974-1975, were compiled into a school publication called The Shore Thing, a preliminary copy of which is included in the fonds. The purpose of the book was to introduce students to their own area and familiarize them with the history of local communities along the Eastern Shore. It was placed in the school library for the benefit of all students. The fonds also consists of yearbooks and a newspaper published by the school during the first ten years of its operation. School history essays and research donated by the Musquodoboit Harbour Heritage Society. Upon donation to the Eastern Shore Archives, the local history archival records of the MHHS were not arranged in any apparent order. Order was imposed by the Eastern Shore Archives based on the contents of the records and consultation with original donor information that was available. Open to researchers without restrictions. The materials from the Musquodoboit Harbour Heritage Society (MHHS) were part of a larger donation made in 2012 when the MHHS transferred all of its archival holdings to the Eastern Shore Archives from the Musquodoboit Harbour Railway Museum. The donation included materials now in the William Ansel Gaetz fonds, Musquodoboit Harbour Heritage Society fonds, Musquodoboit Harbour Tennis Club secretary’s book, Eastern Shore Archives school attendance registers collection, Stanley F. Flaherty family fonds, and the David James Vaughan fonds. [Eastern Shore District High School, Valley Views Special Supplement Musquodoboit Harbour, Spring, 1979], Musquodoboit Harbour Community History, Cabinet 4, Drawer 1, Eastern Shore Archives, Lake Charlotte, NS.